Fast, Professional Service Whenever You Need It! We know we're the best, which is why you don't pay until you're happy - Guaranteed! Emergency expenses stressing you out? Don't worry, we offer financing! New customers get $40 OFF any repair! As a local HVAC company – AAC Services has been serving Metro Detroit with professional heating & cooling services since 1992. Founded on hard work & a dedication to quality service, we have successfully earned our customers’ trust over the years. Our goal is to keep you warm in the winter, cool in the summer, and comfortable & safe all year long. 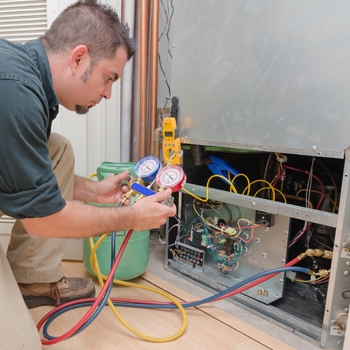 AAC Services employs a highly trained technical staff that has years of experience installing & servicing all types of heating & cooling systems. When you require HVAC installation, repairs, or maintenance, please be assured that you will be getting the highest level of service & parts from the professionals at AAC Services. Our service department can provide you with 24-hour emergency service, 7 days a week, 365 days a year. We service any make and model of furnace or air conditioning system. Our service technicians are a mobile workforce dispatched for faster service to your home or business and carry all major name brand parts on our trucks, so there is no waiting for parts or paying for travel time needed to pick up parts. We also have someone to answer your call 24-hours a day, with NO answering machine! A service technician will respond to your call within 15 minutes or less. You can relax knowing the job is already getting done. At AAC Services we can help you with our many years of experience and knowledge. We can help design a heating & cooling system to fit your needs, and no project is too large or too small. We understand the process of scheduling that is involved with a busy lifestyle. We are committed to providing you with superior service & workmanship at a competitive price. Thank you for visiting our website. We are always here to answer any questions you may have; so please feel free to give us a call anytime.